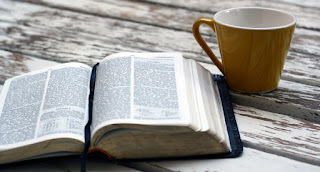 Get organized: It's a New Year's resolution we seem to make year after year, BUT as life gets busy, it's easy to let clutter take over again, unless you manage it the right way. 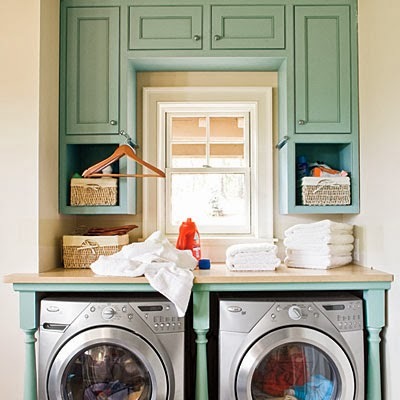 Get our advice, tips, and tricks to make 2014 the year you get organized once and for all.....In The Laundry Room! 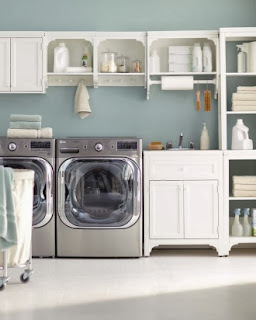 Decorate Your Space ~ If you have the luxury of having a spacious laundry room, use it as a place to show off favorite items. This room’s combination of closed cabinets and open shelving gives the homeowner plenty of storage and display options. Recessed lighting within the shelves further highlights the display. 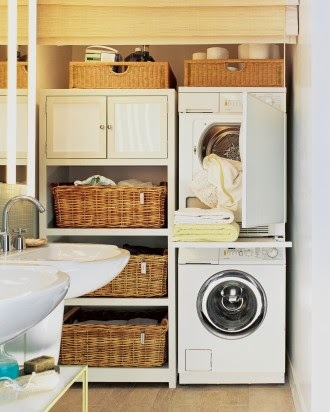 Tight-Space Laundry ~ In the compact laundry workstation and storage area of a small bathroom, the stacked European-style washer-dryer set economizes space. A shelf between units pulls out for folding items fresh from the dryer, then slides out of sight. 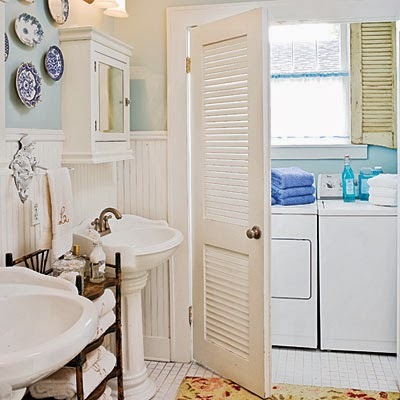 A matchstick shade lowers all the way to the floor, gracefully hiding the utility area when guests are expected. Use a Serene Color Palette ~ A serene color palette creates a sense of organization in your laundry room. Here, the cabinets and table legs are painted a soothing moss green while a light-colored stone countertop completes the overall calming effect and provides a durable surface for folding. Everything In Its Place ~ A laundry room that has plenty of storage options and is also pleasing to the eye will help keep you organized. Mix and match the hutches, wall-mounted shelves and cabinets shown here from Martha Stewart Living™ Laundry to create a custom laundry system that works for your home. 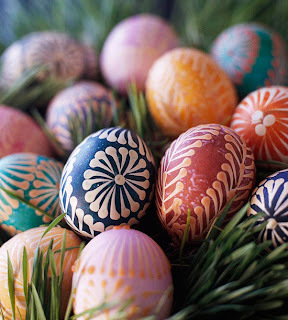 Hide the Necessary Supplies ~ Conceal unsightly laundry detergent, cleaning supplies, and any other products that look like messy clutter in fronted cabinets. A hanging rod was added here to keep drying clothes neat. 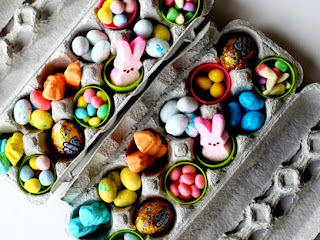 Baskets create additional storage to keep what’s left out sorted and contained. 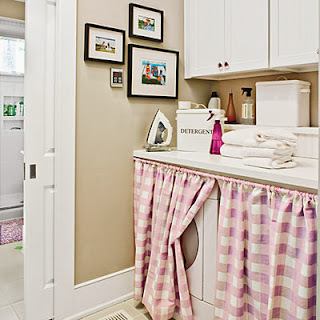 Treat the laundry room as you would any other space by adding cheerful curtains. 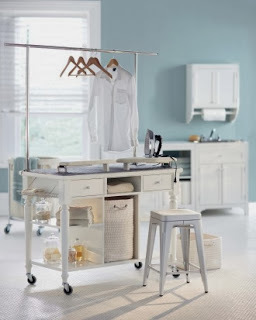 All-in-One Cart ~ This cart is the perfect solution for smaller spaces - use it to hold all of your laundry supplies as well as an ironing surface. 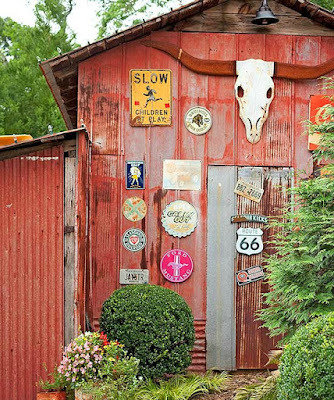 The wheels allow for mobility around your home as well. 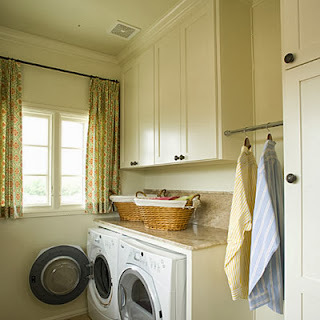 Conceal with Curtains ~ A pretty plaid curtain hides the washer and dryer in this upstairs laundry room. The homeowner hung a standard spring rod just below the counter and picked a fabric that coordinated with the adjoining spaces. 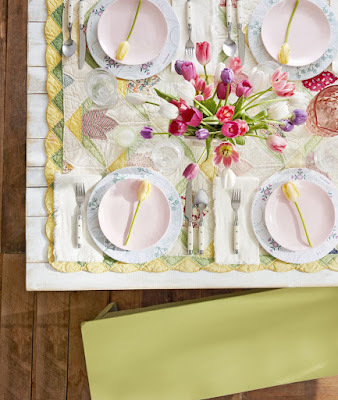 Family photographs or children’s artwork also instantly add personality to a workspace. Work With the Space You're Given ~ Whether your washer and dryer are tucked away in a tiny nook or are settled in a spacious basement, utilize every square inch of the area. With limited shelving, keep your workspace as simplistic as possible to avoid clutter. 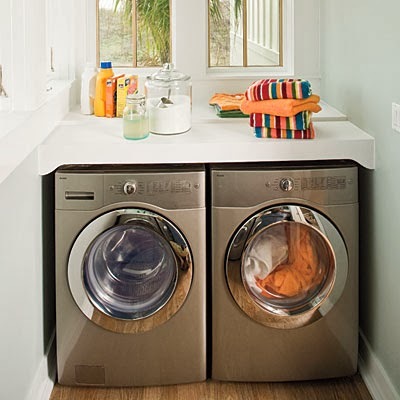 A built-in shelf over the washer and dryer allows a convenient storage surface without blocking the windows. In a smaller space, such as the one pictured here, be sure that the room is well lit with task lighting or accent lighting. Create an Ironing Station ~ Keep all of your ironing supplies convenient and in one place. 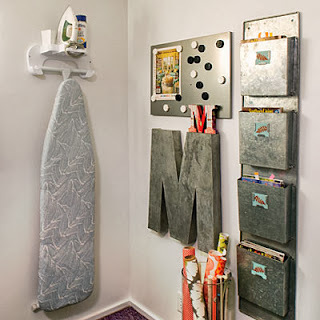 Many big box stores carry stow-away ironing board systems that can be easily hidden behind a cabinet door or over-the-door iron and board hangers that are designed to hold any style of ironing board. Look for units that have a shelf to store spray starch and other supplies. 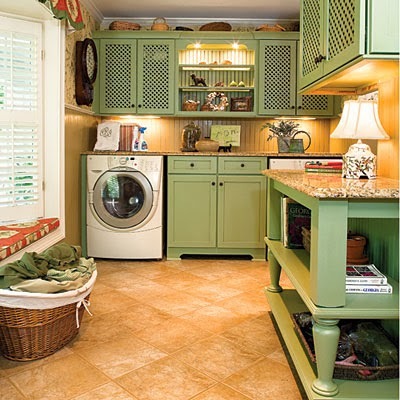 Camouflage the Room ~ This laundry room is merely an extension of a bathroom. Double-louvered doors keep the washer and dryer neatly tucked away in a separate tiny room when they are not in use. Keeping the bathroom and laundry spaces the same color creates cohesiveness and allows them to function as one room. 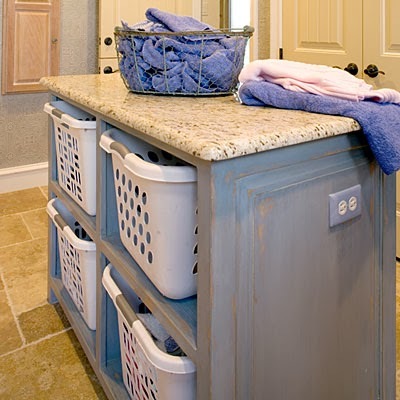 Add a Storage Island ~ To keep large and unattractive laundry baskets off the floor, this homeowner custom-designed shelving inside the island in the laundry room. The functional baskets are used to separate laundry loads. The storage island also doubles as a folding area for clothes coming right out of the dryer.